Cake Appreciation Society is liking this! We'd love to know who made this cake? This cake is fabulous, however, a bit unrealistic. It is a show stopper for business purposes for certain, but really, who would have this at an actual wedding? Well unless you have a "groom cake" also!! 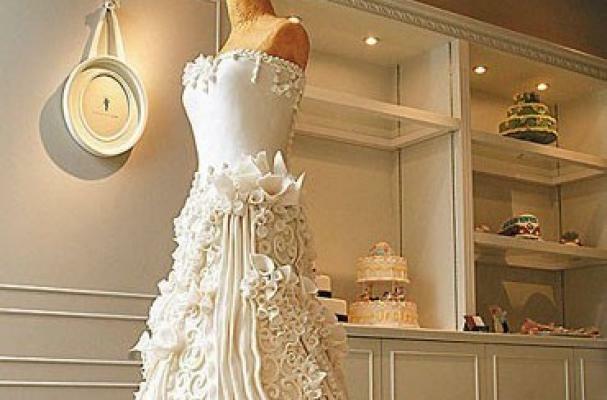 I agree that it would be unrealistic for a wedding, but it is great for a bridal shower don't you think? I can see this at one of those million dollar platinum weddings with 400 guests. Or a smaller table version for a smaller wedding. This is seriously the coolest thing I've seen this year. Unfortunately we have not been able to locate the creator, but we are searching! We are sourcing the photographer who posted the image. You posted that you have found the creater as of January 2012. 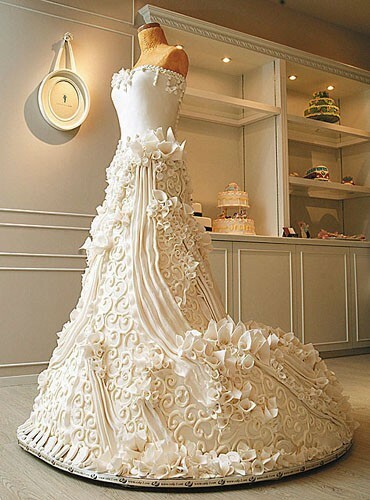 Today is July 1 and I just saw the pic for the firs time of this incredible cake dress... have you learned the identity of the creator? a website? anything?